Mona B Tri Corner Canvas Tote P.C. Fallon Co. The Scenic Route Weekender Bag by Mona B. inspires spontaneous road trips and weekends away. 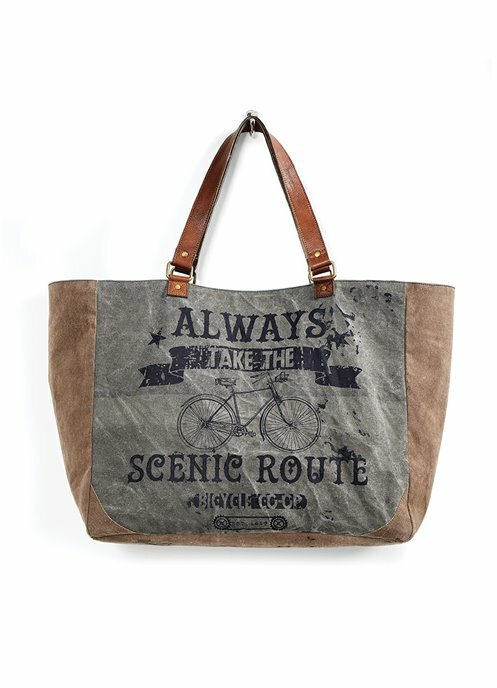 The front is imprinted in black vintage-style font, "Always take the scenic route" with a printed bicycle, and "Bicycle Co-op Est. 1817". Zipped closure. The very spacious interior is lined with the signature Mona B. cotton fabric and contains 1 zipped pocket and 2 slip pockets. Leather/Canvas handles have a 10" drop. Tote measures 19"W x 16"H x 8"D. Made from up-cycled canvas from military tarps and tents. The fabric shows the history of its travels which may include stitch marks, minor staining and unique scars and bruises. Color variations and patches add to the uniqueness of each bag. Heavy cotton canvas.